WHAT IS THREAD COUNT, REALLY? Is there anything better than sliding into a bed laden with good quality sheets? At the end of the day, I can't wait to stretch out under my fresh, soft covers and nestle my face into a good cotton-covered pillow. We spend a third of our lives in bed so quality sheets are key. We expose the truth about thread count and what it takes to find quality bed sheets. Thread count is simply the number of threads per square inch of fabric. 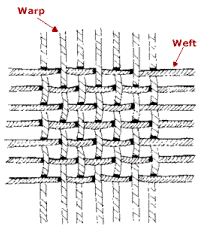 These consist of vertical threads (warp) and horizontal threads (weft) woven together. Construction refers to how the thread count is achieved (# of warp and weft yarns, # of picks in the weft , use of 2 ply yarns, etc.) To achieve higher thread counts, sometimes 2 ply yarns are used and sometimes multiple yarns (picks) are inserted into the weft. The FTC has ruled that plied yarns should each only be counted as one thread for the purposes of thread count. This is not enforced, but in response the market has moved more toward single plies with multiple picks as the preferred method of achieving higher thread counts. In weave quality terms alone, the best fabric would be made with single ply yarns and have a single pick, but the highest thread count you can get with this type of construction is about 400. Above that, 2 ply yarns and 4 ply yarns being used by manufacturers of yarn from these countries Egypt, China, Pakistan, India , Brazil & Portugal . Sateen is a fabric made using a satin weave structure but made with spun yarns instead of filament. The sheen and softer feel of sateen is produced through the satin weave structure. Warp yarns are floated over weft yarns, for example four over and one under. (In a weft-faced satin or sateen, the weft yarns are floated over the warp yarns.) Standard plain weaves use a one-over, one-under structure. The long floats produce a surface that is smooth to the touch and reduces light scattering to increase shine. This weave structure is more susceptible to wear than other weaves. In modern times cheaper rayon is often substituted for cotton. Better qualities are mercerized to give a higher sheen. Some are only calendared to produce the sheen, but this disappears with washing. What is meant by Percale? Carded cotton is cotton which has been prepared for spinning into thread or yarn. Carding is an important step in the processing of many textiles, ensuring that debris is removed while aligning the fibres’ to make them easier to spin. Without carding, cotton thread would be coarse and extremely fragile. For extra-fine cotton, people may use a cotton comb to pull out additional short fibers after carding, ensuring that the cotton fibres’ are all the same length. Combed is extremely soft and silky to the touch, and it tends to be more expensive, because a higher volume of cotton is removed during processing. Before any textile, including bed sheets, can be made, the manufacturers have to produce the yarn. The quality of a sheet depends on its yarn count, which is a numerical value that tells you how fine or coarse a yarn is. e.g. 16’s, 30’s, 40’s. In this system the lower the count, the thicker the yarn, so a 16’s yarn will be thicker than a 40’s yarn. The higher counts represents e.g. 40’s, 60’s ,80'& 100's will be used in premium quality bed linen . In technical terms, it's the value of the linear density (the diameter) to which that yarn was spun. When helping you fall asleep, this is the count that will matter. A pill, colloquially known as a bobble, fuzz ball, or lint ball is a small ball of fibres’ that forms on a piece of cloth. 'Pill' is also a verb for the formation of such balls. Pilling is a surface defect of textiles caused by wear, and is considered unsightly to some. Moisture Control. Cotton fabric is breathable and transmits moisture away from the body and is absorbent and removes liquid from the skin, like a towel, according to Cotton Incorporated. Cotton allows you to remain comfortable as you exercise, keeping moisture from building up between your skin and clothing. Polyester, being a synthetic fibre, is a less expensive option and has many benefits that cotton does not. It has strong fibres’ that do not wear down as quickly, while being flexible and resistant to wrinkles and shrinking. What is the difference between bag style and envelope style duvet covers? Bag Style: This is the traditional style of hotel duvet cover that incorporates an open end that can be tucked under the mattress, making it easier to change than other varieties. 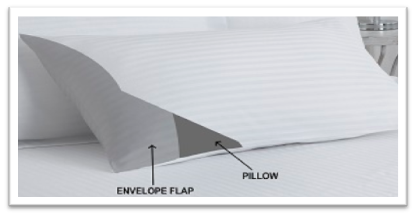 Envelope Style: Envelope style duvet covers feature an internal flap which closes the duvet inside and holds it in place. Shoulders Style: Also known as Tack Style - This is a variation on the open bag style. 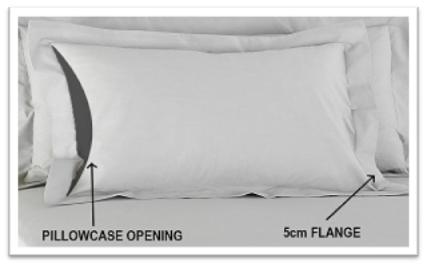 Usually shorter than the traditional bag, because instead of having an open end that is tucked under the mattress, the corners of the bag feature stitched shoulders to hold the duvet in place. Difference between Housewife, Bag style and Oxford l pillowcases? 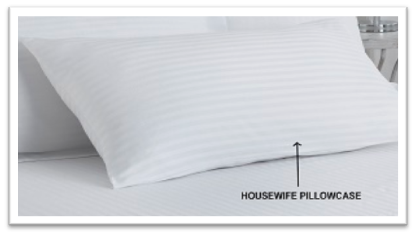 Housewife style: For those of you who aren't aware of it that a Housewife Pillowcases have a sewn edge 15-20 cm, which fits snugly to the pillow. 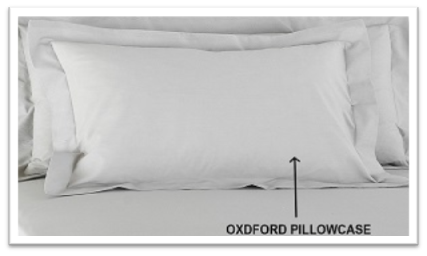 Oxford style: Oxford Pillowcases have a fabric border around the edge, usually around 5-7 cm. Inside sewn flap of 15-20 cm to tuck the pillow. 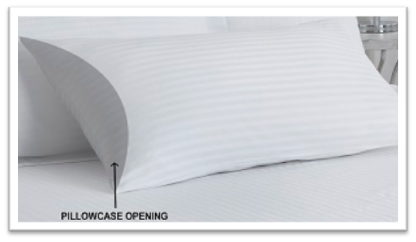 Bag style: These are ideal for hotel & hospitality sector as it allows housekeepers to swiftly change the bedding within no time. Bed linen - Why wash before use? The sheets of all the thread counts and type being used, the texture of new sheets can be scratchy. And darker coloured sheets may also have excess dye on them. Before putting a new set of sheets on a bed, run them through a wash cycle. Typically 100% cotton products shrink by 5-8% and poly cotton products shrink by 1-4 %. always pre-wash new linens before using. As fine fabrics are generally not pre-washed, this first wash is important for setting the threads, preserving the fabric’s beauty, and prolonging its life. Be sure to fully unfold, set the machine to include a cold pre-soak, and use minimal liquid detergent. Following the first wash, refer to our Machine-Wash Instructions below. Use of a fabric softener (liquid or dryer sheets) is not recommended for any fine linen, as it coats and weakens natural fibers’. Your luxury linens will soften naturally with frequent use and additional washings. We recommend using three sets of bed linens in rotation: one on the bed, one in the wash, one in the linen closet. This will allow each set a rest from use and a rest from wash. Similarly, we recommend that you wash matching linens (e.g. sheets and pillowcases) together, as each piece should be cared for similarly regardless of whether or not it is soiled (or even, used) to help maintain colour consistency and brightness. Remove jewellery and watches, or other accessories that may damage fibers’ while sleeping. The added abrasion can—over time—breaks down the fibers’, possibly resulting in pilling. Take care when drawing up your sheets or shimmying a pillow into its case: pull from below the hem—not on or above the hemstitch, lace detail, or embroidery—so as not to subject these delicate threads to undue stress. Avoid laundering fine linens with other items, especially those containing polyester, and items made of heavy material, rivets, buttons, zippers, etc., (for example, denim jeans) as these can damage fibers’ and fabric. Do not overload the washing machine, as this can cause unnecessary abrasion to the fabric. Always check the care label before laundering, and separate linens into light and dark colours. Most linen can be washed on a gentle cycle in warm water with a cold-water rinse. Pre-treat any stains prior to washing; do not use bleach (bleaching may weaken fabric and cause yellowing). Use a mild liquid detergent without added bleach, optical brighteners, whiteners, or fabric softeners. Do not pour detergent directly on textiles; rather, add it to the water as the wash tub fills or dilute detergent with water, then add linens. Do not use bleach—bleaching may weaken fibers’ and cause them to yellow. TIP: Unless linens are very soiled, you need only use half the recommended amount of detergent. Natural fibers’ will wrinkle, but there are steps you can take while drying linens to minimize wrinkling. Line drying linens in soft, outdoor sunlight is ideal—it is the most gentle, and the sun provides natural bleaching—though this is not always practical. To machine dry, gently shake out and smooth damp linens before placing in the dryer (unraveling any items that may have twisted in the wash cycle). Do not use dryer sheet fabric softeners. Avoid overloading the dryer so items will dry evenly. Set to the lowest heat—high heat settings will weaken the fibers and increase shrinkage. Remove items from dryer promptly and while still slightly damp; smooth and let air dry before storing, or press with an iron while damp to remove any remaining wrinkles. Always check to make sure your steam iron is clean—mineral deposits may build up and cause brown spotting. Iron linens while still slightly damp. Spray with water from a spray bottle for stubborn wrinkles, if needed. To restore the lustrous face of sateen and jacquard fabrics, iron on the reverse side. To preserve the three-dimensional effect of embroidery, iron on its reverse side, atop a white towel to give soft support to the thread work design. Linens with delicate lace and cutwork should be ironed beneath a press cloth. Unit 302, New Greenham Business Park, Thatcham RG19 6HS.